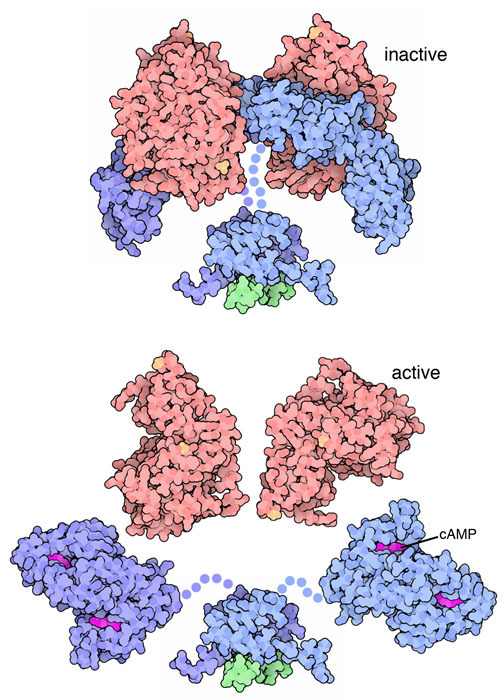 Inactive (top) and active (bottom) forms of cAMP-dependent protein kinase. Flexible portions of the protein are shown schematically with dots. Phosphate groups are perfect chemical groups for modifying the function of proteins: they have a strong negative charge, they are fairly bulky, and they can form multiple hydrogen bonds. 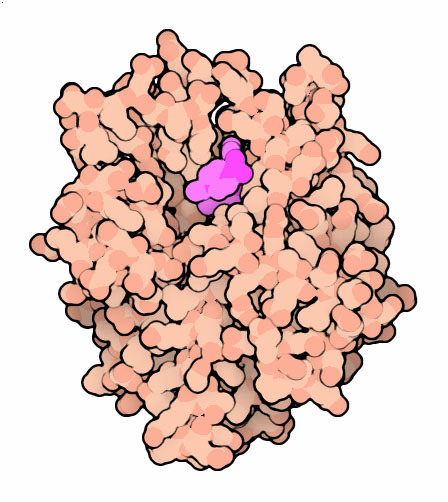 When a phosphate group is attached or removed to a protein, it may modify the shape and flexibility of the protein chain, or provide a readily-visible handle for recognition by other proteins. Cells take full advantage of these possibilities, and in a typical cell, phosphate groups are used to regulate the function of about one third of their proteins. Protein kinases are used to add phosphate groups to proteins. 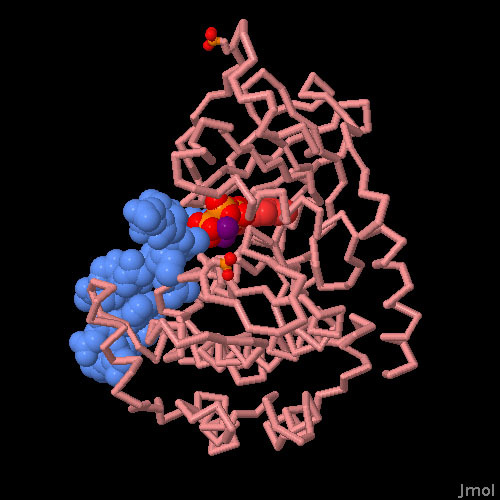 The one shown here is cAMP-dependent protein kinase, also known as protein kinase A or PKA (PDB entries 3tnp , 1j3h and 2h9r ). It is composed of two types of subunits. The catalytic subunit, shown here in pink, performs the phosphate-adding reaction. The regulatory subunit, shown in blue, senses the level of cyclic AMP, and turns the catalytic subunits on or off based on that level. When cAMP levels are low, a dimer of the regulatory subunits binds to two copies of the catalytic subunit, forming an inactive complex (shown at the top). When cAMP levels rise, it binds to the regulatory subunit, releasing the catalytic subunit in an active form (shown at the bottom). PKA is an essential link in a cascade of messages that control energy utilization in cells. Receptors such as the beta-adrenergic receptor and the glucagon receptor stimulate the production of cyclic AMP. This activates PKA, which then phosphorylates many proteins involved in generation of cellular energy, regulating proteins like glycogen synthase and pyruvate kinase directly and also changing the synthesis of proteins by phosphorylating key transcription factors. As you can imagine, these kinases must be carefully regulated to make sure they add phosphates at the proper time and in the proper place. Several types of regulatory subunits for PKA are built by our cells. By mixing and matching these subunits, different types of cells can tune the function of PKA for their needs. In addition, the regulatory subunits form complexes with other scaffolding proteins, known as AKAP proteins. These scaffolds hold PKA close to its partners in the signaling cascade, further tuning its function. A short peptide from an AKAP is shown in the illustration in green. Cells also need a method to stop the signal carried by cAMP. Specialized phosphodiesterases break the unusual cyclic phosphate bond in cAMP, forming AMP and making it inactive as a signaling molecule. Cells make many types of phosphodiesterases to tailor cAMP signaling for the needs of particular types of cells. Caffeine (the stimulant in coffee) and theophylline (the stimulant in tea) inhibit many forms of this enzyme, prolonging the energetic messages carried by cAMP. Drugs like Levitra and Viagra, on the other hand, inhibit only one type of phosphodiesterase (shown here from PDB entry 1xp0 ), and have a more targeted effect. he catalytic subunit of PKA is very flexible, opening and closing during its phosphate-adding reaction. Like many enzymes that use ATP, the active site is buried deep inside the enzyme, and several metal ions are used to position ATP in the proper place. Crystallographers have determined the structure of many steps in this reaction. To explore some of these structures, click on the image for an interactive Jmol that shows PDB entries 1j3h , 2cpk , 1atp , 1jlu and 1bx6 . You can use the Ligand Explorer to see the many interactions that hold ATP and similar molecules in the active site of PKA. Structures of several different types of PKA regulatory subunits are available in the PDB. You can use the "Compare Structures" tool to look for similarities and differences between these subunits, for instance, between entries 1rgs, 1cx4 and 4din. D. A. Johnson, P. Akamine, E. Radzio-Andzelm, Madhusudan & S. S. Taylor (2001) Dynamics of cAMP-dependent protein kinase. Chemical Reviews 101, 2243-2270. S. S. Taylor, C. Kim, D. Vigil, N. M. Haste, J. Yang, J. Wu & G. S. Anand (2005) Dynamics of signaling by PKA. Biochimica et Biophysica Acta 1754, 25-37. S. H. Francis, M. A. Blount & J. D. Corbin (2011) Mammalian cyclic nucleotide phosphodiesterases: molecular mechanisms and physiological functions. Physiological Reviews 91. 651-690. S. S. Taylor, R. Ilouz, P. Zhang and A. P. Kornev (2012) Assembly of allosteric macromolecular switches: lessons from PKA. Nature Reviews Molecular and Cellular Biology 13, 646-658.